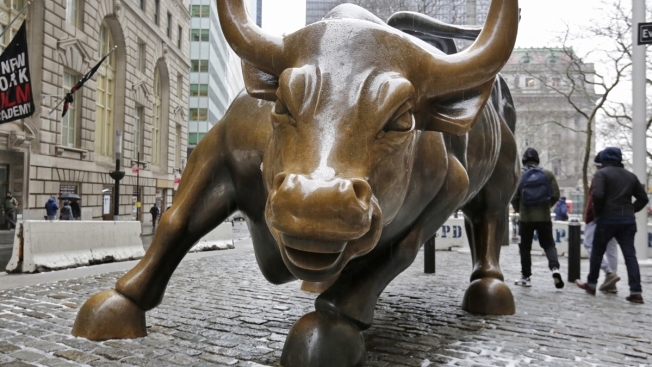 This Feb. 7, 2018, file photo shows the Charging Bull sculpture by Arturo Di Modica, in New York's Financial District. Stocks closed sharply higher on Monday, bouncing back from strong losses in the previous session as trade tensions between the U.S. and China appeared to ease, CNBC reported. The Dow Jones industrial average surged 669.40 points to 24,202.60, with Microsoft as the best-performing stock in the index. The S&P 500 gained 2.7 percent to close at 2,658.55 — bounce off its 200-day moving average— with technology and financials leading all sectors higher. The Nasdaq composite advanced 3.3 percent to 7,220.54 with Apple and Amazon both rising. Markets overseas also jumped on Monday. In Asia, some indexes rose after news surfaced that the U.S. had agreed to excuse South Korea from steel levies. Meantime in Europe, stocks were lower as investors failed to shake off trade war worries.